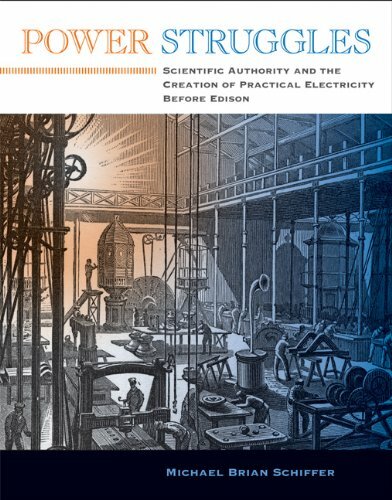 Power Struggles: Scientific Authority and the Creation of Practical Electricity Before Edison (2011) by Michael Brian Schiffer traces the invention, commercialization, and adoption of electrical technologies that laid the foundation for Edison’s work. In 1882, Thomas Edison and his Edison Electric Light Company unveiled the first large-scale electrical system in the world to light a stretch of offices in a city. This was a monumental achievement, but it was not the beginning of the electrical age. The first electric generators were built in the 1830s, the earliest commercial lighting systems before 1860, and the first commercial application of generator-powered lights (in lighthouses) in the early 1860s. In Power Struggles, Michael Brian Schiffer examines some of these earlier efforts, both successful and unsuccessful, that paved the way for Edison. After laying out a unified theoretical framework for understanding technological change, Schiffer presents a series of fascinating case studies of pre-Edison electrical technologies, including Volta’s electrochemical battery, the blacksmith’s electric motor, the first mechanical generators, Morse’s telegraph, the Atlantic cable, and the lighting of the Capitol dome. Schiffer discusses claims of “practicality” and “impracticality” (sometimes hotly contested) made for these technologies, and examines the central role of the scientific authority--in particular, the activities of Joseph Henry, mid-nineteenth-century America’s foremost scientist--in determining the fate of particular technologies. These emerging electrical technologies formed the foundation of the modern industrial world. Schiffer shows how and why they became commercial products in the context of an evolving corporate capitalism in which conflicting judgments of practicality sometimes turned into power struggles.